The limit on secure form submissions is 10 per month. The upgrade or paid options show how one's allowance of submission numbers would increase, but doesn't seem to mention the secured submissions. Does this limit increase with a paid subscription as well? - PREMIUM: 1,000 SSL secure submissions per month. 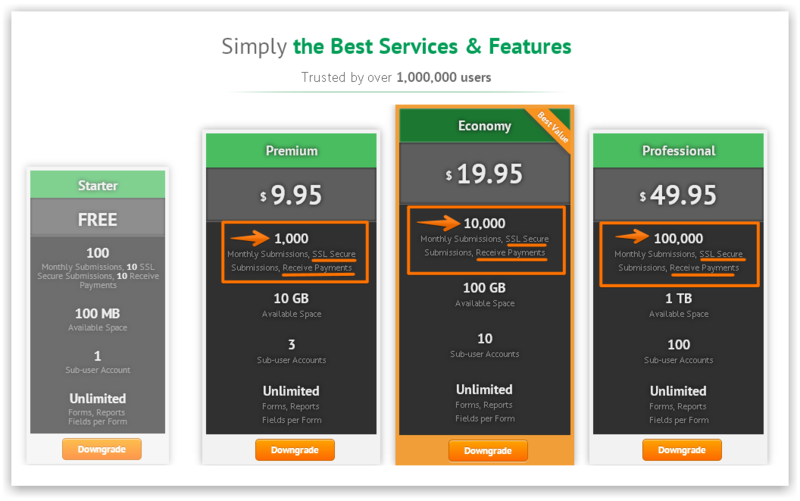 - ECONOMY: 10,000 SSL secure submissions per month. - PROFESSIONAL: 100,000 SSL secure submissions per month. I hope this helps. Please inform us if you need further assistance with this.